I love the irony of this news. Via Steve Dilbeck at the LA Times we find out that the law firm that represented McCourt in his BK has just filed for BK themselves. Then Bill Shaikin notes that the, "McCourt Management of Dodgers Under Grand Jury Investigation." Wha???? News related to McCourt and the Dodgers just doesn't want to go away. Orel at the Sons of Steve Garvey notes how much Dodger fans love to spell. Then DelinO at SOSG follows that up by telling us where Dodger fandom could progress towards. The latter is not a pretty sight. Bob Lemke has a couple of great post up reminding us of the various color barriers that were still left to cross by 1952. Part 1. Part 2. Jackie Robinson is prominent in both blog entries. True to the Blue has a recap and photos from the recent signing at Frank & Sons with Guerra, Jansen and De La Rosa. Jerry Crasnick at ESPN notes on twitter that the Dodgers expect Lilly to miss only 2 to 3 starts. Philip Anschutz-controlled AEG Corporation, which owns the Kings and the Kings' home arena Staples Center, and its CEO Tim Leiweke, have started marketing the team by directly calling suitors, a source told the New York Post. A few years ago, the Kings first put themselves up for sale seeking more than $200 million, but now likely will accept less, the source said. 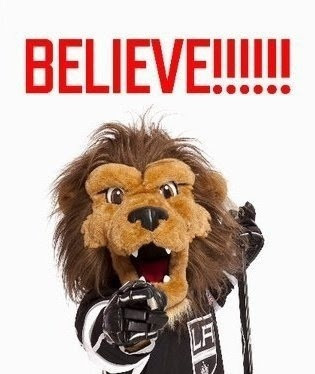 Game 1 is tonight at 5:00 PM PST. It's a horrible start time, but what are ya going to do? 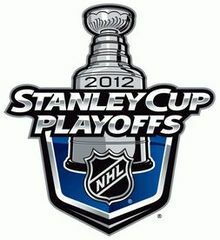 Below is this years 2012 Stanley Cup Finals commercial. 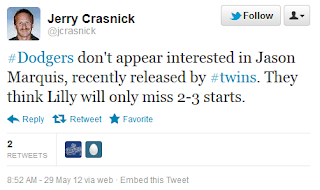 It was initially featured by Greg WhyShynski at Puck Daddy. I am forever hopeful that this is the Kings year to join the boys below. I had received word yesterday afternoon that Don Mattingly was slated to appear on "Intentional Talk" with Chris Rose and Kevin Millar. Unfortunately, it was at 2:00 PM PST, so I was unable to hear it live. Thankfully, the power of cyberspace strike again as the good folks at the network makes the entire interview available to view. Check it out below. It's a long interview, so there is much to take in. The skipper chats about his own playing days, his first postseason and the rise of Matt Kemp. And be sure to take note of his nefarious past as a popcorn thief. It's a gas. Here are this weekends autograph opportunities throughout the Southland. As always, be sure to check the Blue Heaven Calendar for other events (a link can always be found on the tab at the top of this page, just left of center), and always confirm with the establishment. Everything is subject to change. Click on any pic to embiggen. This listing is just for your information. I am not aware of any autograph guest slated to appear at the Long Beach Coin, Stamp and Collectible Expo this coming weekend, but I do know that for the first time in a decade they will have a Sports Collectibles section. 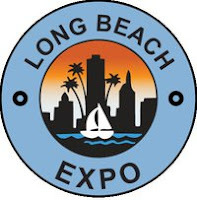 This show is noted as one of the nations biggest and more important stamp & coin conventions. Heritage will be having an auction featuring coins, and Memory Lane will exhibit rare baseball cards, autographs and memorabilia; including a Ruth-signed bat. I received a free pass since I'm a PSA set Registrant, so I plan on taking a bunch of pics. Thur. and Fri.: 10 a.m. - 7 p.m.
Public admission is $8 (good for all three days); $6 for members of any coin or stamp club; $4 for seniors 65 and older and for children ages 8 to 16. Free admission for PSA and PCGS Collector Club members, PSA and PCGS Set Registrants, PSA and PCGS Authorized Dealers and for children ages 7 and younger. Former star pitcher and inspiration to all, Jim Abbott, will be all over the Southland to promote his book. Check out the cover above. There are 3 separate events to go to. Held in the Terrace Level Team Store prior to and during the game. Isotopes Blogger and frequent twitterer (is that a word now?) Evan at New Mexico Fan was kind enough to pass along some of his photos from Matt Kemp's 2012 debut as an Isotope this past Sunday. Check out those photos here. As you know, he was in Albuquerque on a 2 game rehabilitation assignment. On the first day Kemp hit a home run and drove in 3 runs. On the second day, Memorial Day, Kemp made sure to leave the crowd in awe of his power. Matt belted his second home run in as many days while also recording a single and double. I don't know if the thin air in Albuquerque contributed to his stats, but I think it's fair to say that he is back. Thankfully, Evan was there to record the day on his camera, and was kind enough to forward along some additional photos for me to share with you. Check them out below. Instead of the camouflage the team wore on Sunday, the Isotopes put on Dodger Blue for Memorial Day. If I'm not mistaken, the swing below resulted in Kemp's home run. Evan noted that Kemp rounded third base with ease, and his hammy looked fine. 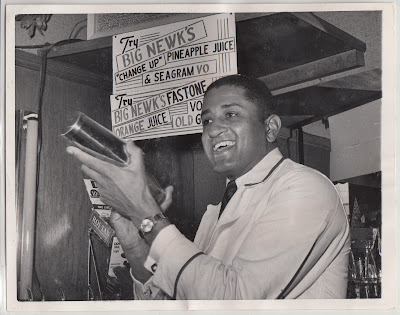 Press Photo Collection: Big Newk's!! Here is another press photo from my collection. This photo comes from the United Press Photo and is dated to November 21, 1956. 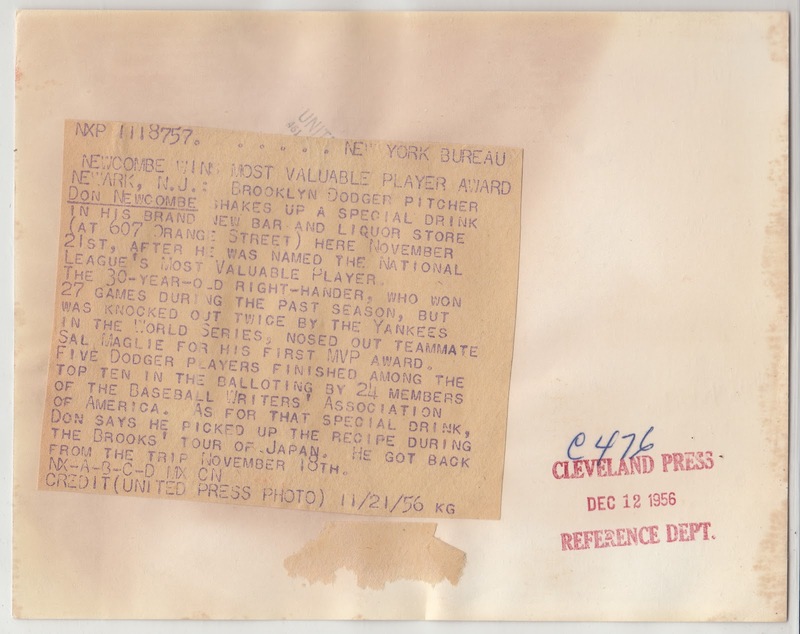 It also appears to have been received by the Cleveland press with a date of December 12, 1956. 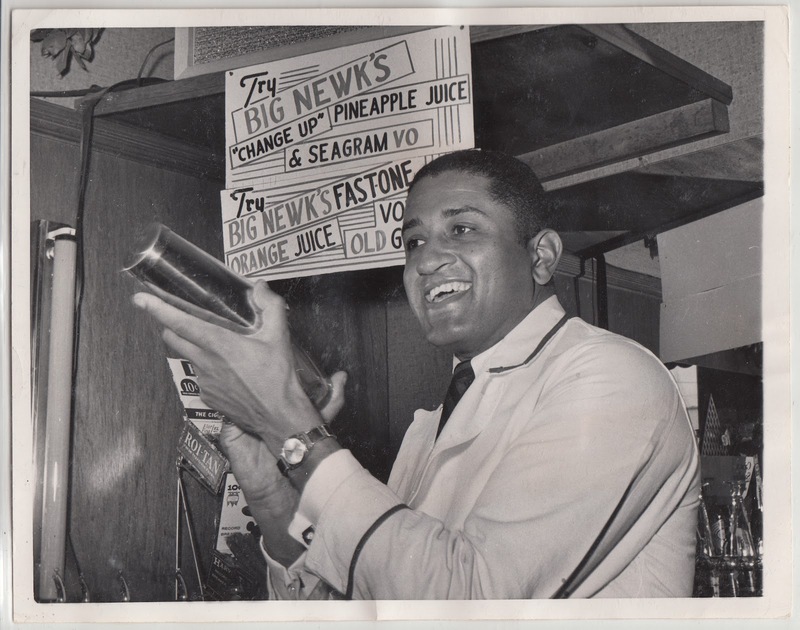 Don Newcombe is seen mixing a special drink at his new bar and liquor store in Newark, New Jersey. He was just named the National League MVP, and he decides to celebrate by sharing a drink he picked up during the Brooks' Tour of Japan that winter.